How to grow Cauliflower vegetables lots of help and advice. Technically, there are two sorts of cauliflowers, summer and winter. The former is a proper cauliflower ,while the latter variety is a type of broccoli. The names 'summer' and 'winter' are a bit misleading. Some summer cauliflowers are sown in winter under glass, for harvesting in late spring or early summer. Maincrop varieties of summer cauliflower are sown outdoors in spring for harvesting in summer and autumn. 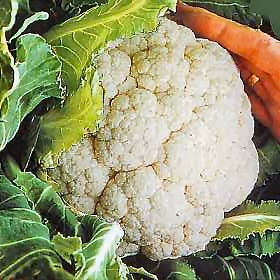 All cauliflowers need a neutral or slightly alkaline soil to do well. 18-24weeksfor summer cauliflower and 36-38 weeks for winter cauliflower. The yield is 0.5-1.0kg(1-2 lb) per plan,5-7 plants per 3 m (10') row. Size, heads are 10-37.5 (4-15") across, stalks 7.5-15 cm(3-6") long, leasvesare45-60 cm (18-24") high. Message: I have some really nice cauliflower leaves but no head of cauliflower. What did I do wrong? I was told it may come out at the end of the summer maybe. It's the end of aug yet no veggie. Tomatoes, peppers, corn were fine.